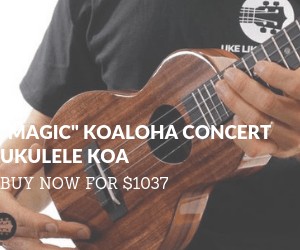 If you’ve heard the rich timbre of a tenor ukulele, you’re probably thinking about giving this instrument a try – and you’re probably wondering which tenor ukuleles are best. If you’re a guitarist and you’re trying to decide between a tenor and a baritone ukulele, you should know that both are good choices. The baritone plays just like the first four strings on a classical guitar, while the tenor plays like the first 4 strings with a capo at the 5th fret. Either way, the transition should be fairly easy although you might take a little time to get used to the smaller size. Whoever you are and however you play, the good news is that tenor ukuleles are more popular than ever, and there are tons of models from which to choose. The bad news is the same. 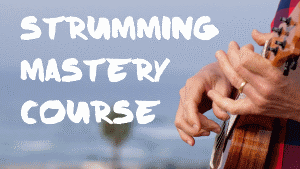 So, how to weed the best tenor ukuleles out from those that aren’t really worth trying? Let’s get started. We love tenor ukuleles for their rich, warm sound – it’s a lot like a classical guitar, but with plenty of Aloha built in. Whatever your reason for choosing a tenor ukulele, be sure to make quality your first priority since this is going to make all the difference. Here’s a quick disclaimer, right up front. 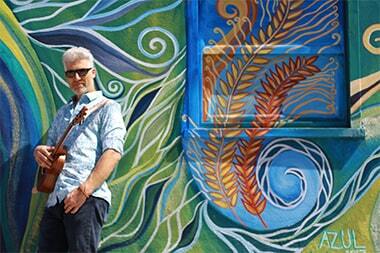 We absolutely love custom ukuleles. There’s nothing quite like an instrument that has been built with your needs in mind. High-end instruments (usually more than $500) are a close second. We’re not including options from either of these categories, since they’re clearly superior and none will give you a bad playing experience. Instead, we’re focusing our efforts on mid-range tenor ukuleles that are easy to find and pretty easy on the average budget. 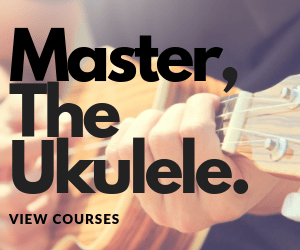 If you’re new to the uke, you’re probably going to want one of these. Same goes for players who are looking for an upgrade, but who aren’t quite ready to invest in their dream ukulele quite yet. 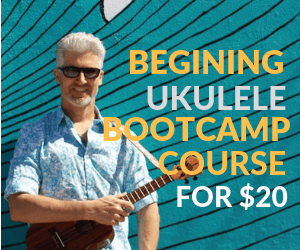 So, get what you can afford, treat yourself if you can, and most of all, be sure to pick up that uke and play it as often as you can! Here are some additional things to consider. The sweet, rich sound of the tenor ukulele makes it unique, and it’s one reason so many people decide that this is a must-have instrument. 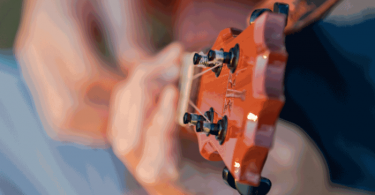 When choosing a tenor ukulele, be sure that you love the way it sounds to your ears! 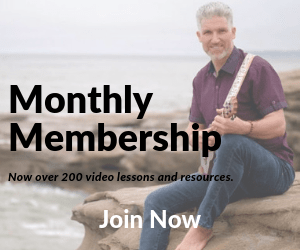 You can find clips of all the most popular tenor ukes being played online, and many manufacturers provide demo videos. 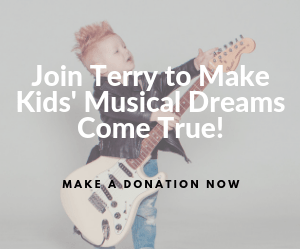 If you have access to a music store that carries ukuleles, you may be able to try some of your top candidates for yourself, and perhaps even support your local store by making your purchase there. If you don’t like the sound, move on to the next option! Good strings matter too. Sometimes simply changing strings makes all the difference in the world in the way an instrument sounds. We’ve chosen options that come with quality strings, but you might prefer something different and find that you need a better set of strings once it arrives. Bottom line? If you’re at all worried about the setup or the action, take your uke to a guitar shop and have them take a look at it. Most of the time, fixes are fast and easy. What is playability? Just like it sounds, it’s the level of comfort you experience when playing the instrument. A playable instrument lets you relax and enjoy the music, while an un-playable one is a real pain to deal with. As you check reviews, it’s a good idea to see what people have to say about their overall experience with the instrument in question. If there are a lot of complaints about sharp frets, rough finishes, etc., then it’s probably best to move on to the next option on your shortlist. Materials used in building a ukulele contribute to its sound and overall quality as well as to its appearance and durability. Everyone loves the idea of playing a beautiful instrument, but what good is it if it sounds terrible? 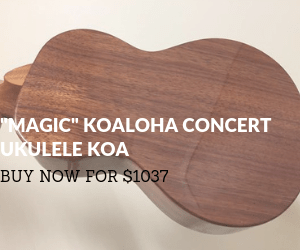 Fine ukuleles are often made with solid wood such as Hawaiian Koa, but this is expensive so most mid-range suppliers rely on woods like acacia, walnut, maple, spruce, and mahogany. Some mid-range tenor ukuleles have solid wood components, but most are made with laminates, which give the instrument a beautiful appearance and enhanced durability, but don’t improve with age like solid wood does. There’s a tradeoff either way. Be sure to take other components into consideration as you choose your new tenor uke. You want good tuners, and you want to make sure that trim is of good quality. Many of the less expensive ukuleles are very simply trimmed out as this cuts production cost. If a ukulele looks fancy and has a low price tag, you might want to do some extra digging to see if it’s really all that it’s cracked up to be. We really want to stress the importance of taking the whole instrument into account and not worrying too much about laminates. Expert players often dislike them but let’s face it, most of us have bills to pay and laminates have their advantages. For us, they’re not deal breakers at all, so long as tuners and other components are worthwhile. On the flip side, if a solid Koa wood ukulele is what you’re after, by all means, invest in one! Today’s mass-produced ukuleles are all over the map. Some are terrible, and reviewers will be quick to let others know it. Others are decent, and some are downright amazing. Many mid-range ukuleles can be enhanced with the addition of better strings and maybe a new nut. We’ve invested hours into the process of weeding out the good from the bad to narrow down your choices and get you playing faster. If you’re into reading reviews, be sure to take your time and look for problems that seem to happen over and over again. Be leery of issues like split wood, warping, and misplaced frets. These do happen from time to time due to quality control issues but when they do, the manufacturer ought to step up and take responsibility for the problem. Most reviewers who have their issues fixed will mention it – and those who have had a bad experience will be vocal about it as well. You’re in luck if you have access to a local music store where you can try out ukuleles before buying. Unfortunately, these shops are few and far between so most of us have to make our purchases online. If you are lucky enough to have a shop that carries ukuleles in your area, do consider supporting them. You’ll get a combination of good quality and service, and you’ll be supporting an important member of your community as well. If you’re buying online and you’re not 100 percent convinced about quality, look to see if there’s a warranty or a money-back guarantee. This way, if you end up with a dud, you’ll at least be able to get your money back and start over. 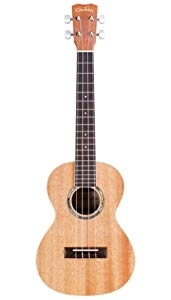 Tenor ukuleles usually have a 17-inch scale length, with a little bit of variation between brands. Keep in mind that the scale length isn’t the actual length of the instrument; instead, it’s the playable span of strings between the nut and the bridge. Nut width refers to the width of the ukulele’s neck at the nut. This determines string spacing and how much room your fingers have on the fretboard. The wider the nut (about 1.5 inches is maximum for most ukuleles with the exception of wide neck models) the more room you have. Average ukulele nut width is about 1 3/8 inches or 35 to 36 millimeters. Most tenor ukuleles accommodate players of different sizes easily – it’s one more reason why this instrument is so popular! 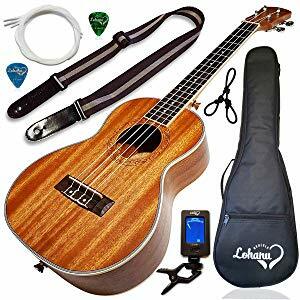 We’re huge fans of Lohanu not just because they offer a lifetime warranty on their instruments and accessories, but also because they offer good quality and pretty amazing prices. the Lohanu LU-T tenor ukulele is one of the most popular tenor ukes on the market right now, and for good reason. This ukulele is simple but beautiful, with a sapele / mahogany top, sides, back, and neck, plus a rosewood fingerboard and bridge. The ABS bindings are handmade, and strap buttons are pre-installed. These fantastic ukuleles feature chrome die cast tuning machines, and they feature arched backs so every note has plenty of sustain and volume. The sound is incredible, warm and smooth. It’s not quite the same as a high-end uke, but amazing nevertheless. Aquila strings are part of the package, along with a strap, a basic gig bag, a tuner, and a few other nice extras. It’s worth noting here that Lohanu had some quality control issues in the past but the warranty inspires quite a bit of confidence in the company’s willingness to stand behind its products. The most recent reviews are mostly glowing, and the price is definitely right. The Cordoba 15TM Tenor Ukulele features a mahogany top, back, and sides, which contribute to its rich, eloquent sound. The ivorioid binding offers a touch of pleasing contrast, and the abalone shell style rosette lends a bit of island-inspired style. The tuning machines are silver with pearl buttons, and premium Aquila strings are included. Despite a surprisingly low price tag, this ukulele delivers lovely intonation, usually with minor adjustments to the setup. It holds its tuning well once the strings have settled in, and it offers plenty of resonance. This might not be the perfect uke, but it’s definitely among the best in its class. If you’re looking for something different, you’re going to want to check out this amazing tenor uke from Kala. This is a gorgeous instrument with an ebony wood body and a walnut fingerboard. The neck is mahogany for strength, and the headstock is mahogany. Simple white binding adds a touch of contrast in keeping with this instrument’s wonderfully earthy appearance. In terms of sound, this ukulele offers rich resonance that will make you crave more. There’s a touch of bright snappiness and sparkle mixed in with the mellow island sound, and it’s tons of fun for everything from jazz chords to fingerstyle. Most reviewers are astonished with this tenor uke’s performance, often comparing it to far pricier instruments. Fender fans, rejoice! The Fender Montecito tenor ukulele is sure to please, from its shapely telecaster-style headstock complete with vintage-style tuners to its genuine bone nut and saddle. This incredible uke will make you look twice, not just because it’s so pretty, but because of its solid koa top, koa wood back, and koa sides. Did we say koa? Yes! The no-tie bridge is a nice touch, and the abalone binding and rosette lends an added bit of island distinction. Aquila strings are included, but you’ll want to upgrade to a better bag if this is your choice. This ukulele is easy on the eyes, but how does it sound? The genuine bone and saddle make for excellent intonation but that’s just the beginning. Expect applause, because it offers ample sustain, plenty or richness and warmth, and enough projection to please audiences at your favorite acoustic venue. 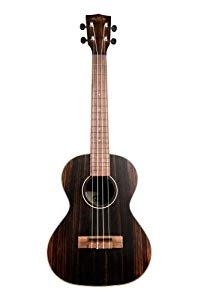 All things considered, this is probably the best tenor ukulele we’ve seen lately, particularly at this price point. 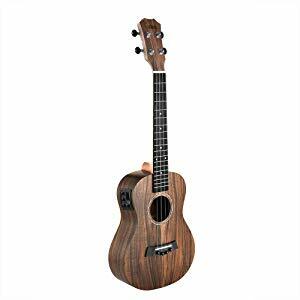 The Caramel CT204 tenor ukulele boasts solid acacia wood top, along with solid acacia sides and back. Like wood from its cousin the Koa tree, Acacia wood features beautifully contrasted graining that gives this instrument a look that’s as gorgeous as its sound. The fretboard and bridge are walnut, and the nut and saddle are genuine buffalo bone. This ukulele features closed, geared tuners, and comes wit Caramel carbon strings. A truss rod is embedded in the neck, making for easy adjustment if needed. If you’ve been thinking about playing with an amp, this ukulele will let you do so. Onboard electronics include 3 band EQ controls, plus a built-in tuner. Whether you’re playing acoustic or electric, you’re likely to enjoy the rich, resonant sound this ukulele provides. Alone or in front of an audience, this ukulele performs beautifully. Once it’s settled in, your new ukulele will bring you hours of enjoyment and help you stretch your musical horizons just a little bit further. Whether you’re new to the ukulele or an experienced instrumentalist, you’re certain to find that the best tenor ukulele is one that meets your unique needs and brings a smile to your face. Aloha, and happy strumming!